SEOm is built fully expandable, based on the size of your team. Independent SEO managers can track and optimise their websites with very minimal set up. Agencies can manage a large number of clients and SEO teams through client assignments & specific permissions. Our deep permission system gives you complete and granular control over your client managers' access to your agency account. Create as many or as few roles as you need, each with their own specific permissions. Permissions run deep through the system allowing for highly specific roles, securing data that should only be available to certain users. Each permission contributes towards the way the SEOm interface is rendered, meaning you can also use the permission system to create clean and unhindered workflows for your SEO client managers. All client accounts running on SEOm have their own dashboard and specific settings. 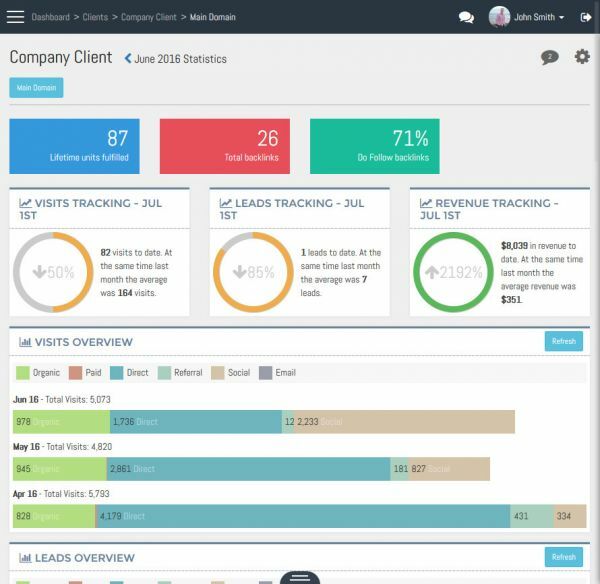 The dashboard gives quick access to critical information for clients, including current keyword positions, SEO work recently performed, along with traffic, leads and revenue data automatically imported from Google Analytics. The client dashboard is a central location where much of the information SEO managers use is imported and stored, so client data can be viewed and assessed at a quick glance. It is simple to track SEO work that has been done for a client, as each task a manager completes is added as a unit record for the​ client. These records can be listed and filtered to quickly see what has recently been done for the client or the lifetime of optimisation and promotion work that has been performed. Assigning a client a current budget, in dollars or your own internal unit measurement, allows for managers to work autonomously until the client's budget has been exhausted.​ This budget can be manually added for a selected month or automatically assigned each month for regular clients. Quickly curate SEO and traffic reports for clients with a click-and-generate system. The standard report is a 'no fuss' report that renders the most critical information of interest to the client, in a simple and easy-to-read format. Custom reports can be created for your agency on request. Reports can be automatically sent to the clients contact email address on a specific date or when report data (keyword ranking, traffic etc.) has been fully collated. Alternatively, reports can be generated and sent manually by any managers that have that permission. Give your clients access to their information so they can watch the progress of their domain/s. Build better client relationships by allowing them to comment and discuss within SEOm, so they feel a part of the process, while keeping the workflow centralised. Specific access for a client can be configured via the permission system, allowing you to give as much or as little access as you require. Get access to quality link source suggestions to use for your own link building strategies. Link sources are all graded on their domain quality, ease of use and effectiveness, as SEOm measures keyword ranking movements and rates link sources accordingly. Your own newly acquired link sources are automatically added to your account, so they become further opportunities for all your clients. This allows the Link Building Assistant to help you quickly capitalise on all link sources, and obtain faster results for your clients. Follow the guidance of the link building assistant to give your clients well-rounded exposure across the web. The assistant will help to speed up your link building process and assist in getting faster results for your clients. The assistant is built to help guide SEOers as they select which client to work on, and which link types to pursue for that client. The assistant enhances your link building strategy with specific information on each link source which helps you get the most from each link source, and advises on streamlining the way you perform your SEO. By granting SEOm read access to your GA account, the system automatically imports traffic, leads and revenue data for each of your clients. This information is displayed on your clients dashboard for quick access in a central location. SEOm connects to your Google Search Console (GSC, formerly Google Webmaster Tools) for automatic importing of visitor keyword data. This data is made available within the client dashboard and is invaluable in assessing current traffic trends and how visitors are entering your client's site. Don't be limited by Google's three month (90 day) historical data restriction - keep eternal access to keyword query data from GSC, stored in SEOm. An internal commenting system helps keep information relevant to each client. 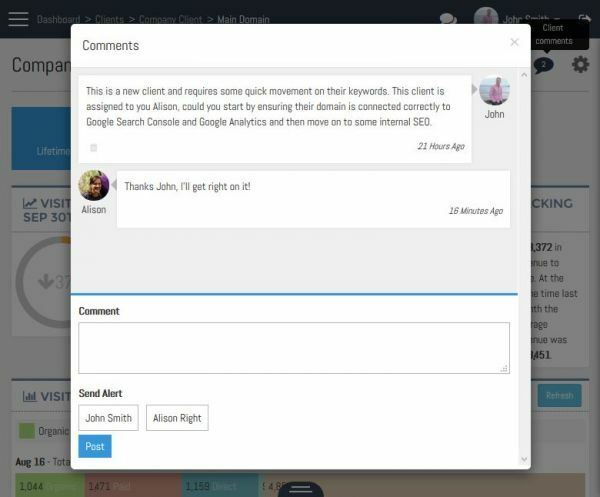 Comments are displayed as a conversation for quick collaboration between administrators and SEO client managers, and/or clients themselves. Comments can be used as a general update for all assigned managers, or can be specifically addressed to a manager or client via the internal alert system. Topics can be created and then used as a forum for internal agency discussion. These discussions can be limited to selected managers only, or opened up to your whole agency. Keep your team in the loop with updates about the agency as a whole, or use it to discuss current SEO trends and client manager training. All comments show the author and profile image, and are time-stamped. All clients' SEO managers can be alerted through the internal alert system. Alerts are displayed on their dashboard for quick review, reply, or dismissal, and are also emailed at their configured email notification regularity. Alerts are created for comments on the Client Commenting system, or in a Topic Discussion that the manager is assigned to.